A police dog and its handler successfully sniffed out a missing man who was hiding in the undergrowth. The man, in his 30s, had been reported missing from Hemel Hempstead at around 11.45pm yesterday (Monday, June 15). 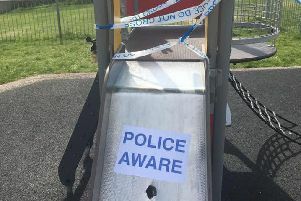 Serious concerns were raised about the man’s welfare and so a number of officers were sent to the area to assist with the search. German Shepherd police dog Tai was deployed with his handler after the man was spotted in Cattsdell, Hemel Hempstead at around 12.50am this morning (Tuesday, June 16). Tai soon began tracking from the road and led his handler into a tunnel near the Nickey Line, across a grassy area and up a bank. The man was then discovered hidden amongst some bushes. Sergeant Vicky Stoughton from the Bedfordshire, Cambridgeshire and Hertfordshire (BCH) Dog Unit, said: “Tai’s nose was put to excellent use and I am very proud of how he and his handler were able to track and find the man, who was thankfully located safely. You can now follow the work of the BCH Dog Unit on Twitter and Facebook. Visit www.twitter.com/dogpoliceBCH and www.facebook.com/BCHPoliceDogs for the latest news about, and photos of, the team and their partners on four paws.